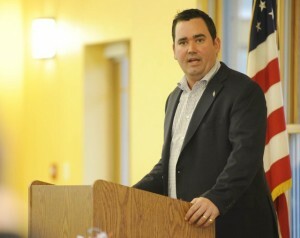 State Treasurer Walker Stapleton: Working for you. Sometimes. It is only Wednesday, but it has not been a good week for State Treasurer Walker Stapleton. And it is only going to get worse from here. Back in 2011, Stapleton filed a lawsuit seeking the release of retirement benefit data for Colorado’s highest-earning pensioners. But the state’s pension fund, the Public Employees Retirement Association (PERA), said the information was confidential and refused to release it. Since then, two lower courts have sided with the pension system on the issue. Stapleton appealed the rulings all the way to the state Supreme Court—but the Court announced today that they wouldn’t be hearing his case. Stapleton has been trying to gain access to information about the top 20 percent of PERA's beneficiaries and their annual retirement benefit. Stapleton's lawsuit, ostensibly to "learn" more information that could give him insight into what he calls "financial DNA" about PERA investments, has been widely dimissed as a political ploy. The PERA board refused Stapleton's request for the data back in 2011, citing privacy concerns and noting that accessing the data was not a function of his role as a trustee of the retirement account. 2012: There were 10 PERA meetings. Stapleton attended 3, but left early at 2 of those. 2013: There were 7 PERA meetings. Stapleton attended 2, but left both early. 2014 (through June): There have been 5 PERA Board meetings. Minutes are not available for the June 24 meeting. Of the other 4 meetings, he has fully attended 1 and left early at another 2 meetings. Stapleton's dismal attendance record at PERA Board meetings makes it difficult for him to argue that his lawsuit — or anything else related to PERA — has been done with the best intentions of Colorado retirees in mind. Stapleton hasn't proven to be particularly savvy when it comes to investment decisions around PERA (or investment advice in general), and his lax attendance at Board meetings further calls into question his capability and interest in managing the state's money. But perhaps more importantly for Stapleton, this information is a serious mark on his resume as he looks to be re-elected in 2014 and hints at a possible run for Governor in 2018. You might recall that Stapleton was widely criticized for moonlighting on the job; Stapleton has continued to work for the real estate firm SonomaWest Holdings while he has served as State Treasurer, and his poor attendance record at PERA Board meetings again brings up the question of just how committed he is to the job in which in was elected to serve. If Stapleton can't find time to attend meetings directly related to his elected position…what is he doing instead? And why are taxpayers footing the bill? I forget this clod is even still around, much less running. He needs to be shown the door, just like Gessler. For the public at large this is a very low profile position. That's why unfortunate things happn such as indies voting for Dems as Gov and Senator or Rep throwing their vote on this one to the other party so they aren't voting straight party ticket. Much to the Koch Brothers' delight. Walker Stapleton, cousin of GW Bush, moonlights as a "consultant" for SonomaWest Holdings … his father, Craig Stapleton is the CEO. I'm sure he considers his salary as Colorado Treasurer as pocket change. Stapleton surely scored some points with the Koch brothers (and AFP) in his campign against PERA. Funny thing. I talked to a lady who aid she was a cousin of his (from the non-Bush side of the family as I recall) while canvassing when he ran the first time. She couldn't stand the guy, lived in a blue collar neighborhood near Cornerstone Park (Littleton/Englewood border area) was a Dem and had no intention of voting for him. Looking at the Bush Family Tree is kind of like watching Gremlins. They just keep multiplying. Don't pour water on Stapleton. Really miss the highly competent, dedicated former Treasurer, Cary Kennedy. +2. She was/is superb, and will be back, if the state of Colorado is lucky. Cary is great. Still looking for great things from her in the future. Journalist should ask . . .
. . . why is Stapleton so interested in Doug Dean's benefits ?? Betsy Markey will be a good Treasurer. Unlike Walker Stapleton, she will work full time, and unlike Stapleton, will focus on other budgetary matters than how to undercut PERA (Public Employee Retirement Association). I saw her speak when she visited Pueblo recently. She's impressive. Some smart people, including Cary Kennedy, have endorsed her. Absolutely; no slight to Ms. Markey intended. She too is absolutely terrific. I just hope Cary too will return to CO public service in some form or another. She will? First she has to win and that's probably not going to happen. I'm sure she'd be better a whole lot than Stapleton and do just fine but probably not on the same level as Kennedy. She's exceptional. Stapleton's only interest in PERA is its demise. Well, yes. In order to make it better we have to completely destroy it and start anew ! Problem is the " start anew " part just never seems to get implemented.